The BT-7 mod. 1937 is a Rank I Soviet light tank with a battle rating of 1.3 (AB/RB/SB). It was introduced in during the Closed Beta Test for Ground Forces before Update 1.41. Like the BT-5, but with improved front armour, it is fast and has an adequate 45 mm cannon able to destroy opposing tanks. The BT-7 is a fast tank with relatively thin armour. It can be useful to flank and hit the side armour of enemy tanks, taking advantage of it's very high top speed. The armour is very well angled at certain points, however being as thin as it is, don't count on it to protect you very well; your speed can be your best defense, so move fast and try to zig-zag a bit to make yourself a more difficult target for tanks farther away (not too much though, or you'll bleed off too much speed). The BT-7 surprises with its Christie suspension. Closer to a race-car than a tank, this lightning on tracks is fun to drive, but not particular easy. With its high top speed and light weight, this tank will drift in turns. For maximum control in turns, reduce throttle beforehand and only tip/nudge the turn key. It needs some time to get used to, however it does prepare you for the T-34s break-turns. Off road behaviour is good and the aforementioned drifts aren't as extreme as on city-roads. Top speed is not really reduced as well, making the BT-7 one of the fastest early tanks due its very wide tracks, something both the Light tank M2 and Panzer II miss. The crew compartment is very small and only inhabited by the driver and the commander. The latter has to perform the tasks of the gunner and radio-man. If a single crew member dies, the BT-7 is "combat ineffective" and then destroyed. "Not getting shot at" is the best advise for the crew to survive. The BT-7 was the last of the BT series of Soviet cavalry tanks that were produced in large numbers between 1935 and 1940. They were lightly armoured, but reasonably well-armed for their time, and had much better mobility than other contemporary tank designs. The BT tanks were known by the nickname Betka from the acronym, or its diminutive, Betushka. The BT-7 Tank's successor would be the famous T-34 medium tank, introduced in 1940, which would replace all of the Soviet fast tanks, infantry tanks, and medium tanks then in service. Ammo racks of the BT-7. Best tactics is probably however to not charge right into the combat, but wait a while to see how the battle develops - observe where and how many enemy tanks go, maybe fire a few shots from the distance. Use your great mobility to get to the best positions. And then use its awesome speed to charge at lonely opponents, which at close range have no chance of keeping their guns pointed at you. Keep in mind that charging into more than 1 opponent is usually a quick end, as it is very hard to not get hit from either of them at the same time. 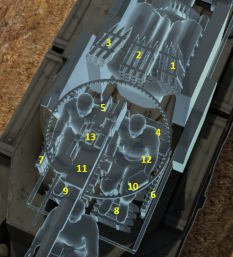 There is basically paper armour on BT-7 to stop anything other than machine gun fire. Finally, try to avoid AA vehicles, as they will have no problem targeting and destroying you, even from the distance. Powerful engine and wide tracks makes the BT-7 a good climber. Often used as a rusher/scout in higher rank matches. It can get to capture points more quickly than most tanks. Difficult to drive with precision - can slew on turns and bounces a lot after braking. The success of the BT light tanks in Soviet service prompted additional upgrades and other developmental projects done on the design to increase its service life. The development led to the final model of the BT light tank series, the BT-7. The tank differed from the older BT-5 tank with a welded hull, redesigned hull front, and a new engine in the Model 1935 version. The Model 1937 version of the BT-7 added a redesigned turret that featured sloping armour. The tank initially had a canted-ellipse shaped turret mounting the main gun and coaxial machine guns with the focus of allowing the tank to mount different tanks without changing the whole design, which led to the development of two main kinds of BT-7s, the normal variant with a 45 mm 20K gun for anti-armour and a artillery variant called the BT-7A which mounted a 76.2 mm KT-26 howitzer for anti-infantry. 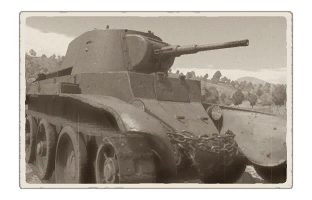 The tank was redesigned before it entered production by using the BT-5 turret instead with the main gun and coaxial machine gun still attached, though the concept of swapping to different guns was still in development for the tank. A radio was also installed on the turret as well. The tank had a three-man crew, the commander/gunner and loader in the turret, and the driver in the front. Production started in 1935, but was redesigned in 1937 with a new conical turret that allowed more ammunition to be stored and a machine gun on the rear of the turret. The BT-7 mod. 1937 also had improvements on the drive wheels, gearbox, and tracks by 1938. The BT-7 went on to be produced from 1935 to 1940 for a total unit production of between 2,700 to 5,300 tanks. The BT-7 served alongside its older counterpart BT-5 tanks. The BT light tanks were meant to be a cavalry tank, and at the time of their introduction they were considered some of the finest tanks against other countries' tanks. They had great mobility of all available tanks, and its 45 mm gun could perform very well in combat. The only drawbacks of the design was its light armour and its gasoline engine, which caused the design to be rather flammable to improvised incendiary weapons. The BT-7's most notable combat service came against the Japanese at Khalkhin Gol. The tactics of Soviet Marshal Georgi Zhukov and the performance of his BT-5 and BT-7 tanks led to a decisive victory. It was during this battle that the BT tanks tendency to catch fire was found, but its performance was positive against the inferior Japanese armoured forces. The BT-7 next combat use was during the opening stages of Operation Barbarossa when Nazi Germany invades the Soviet Union. The superior German tanks Panzer III and Panzer IV were able to easily take out these lightly armoured tanks. Reports note that about 2,000 BT-7 tanks were lost in the first 12 months alone against the German forces, with hundreds broken down from low maintenance and were abandoned. Despite their inferiority, the Soviets continued to produce and field them among armour and mechanized units to boost their operational capacity, though most were kept away from the front lines due to their inadequacy. The BT-7 would finally see its service again in Soviet invasion of Japanese-controlled Manchuria. The Soviets fielded the BT-7 and other tanks in its inventory against the inferior Japanese forces in Manchuria, where it proved very effective against the more lightly armoured Japanese tanks employed. The BT series were all retired after the end of World War II due to their obsolete design as a inter-war period tank design. Perhaps the most important impact the BT light tanks series was that it kick-started the development of the T-34 medium tank, which would go on as the most produced tank of World War II. 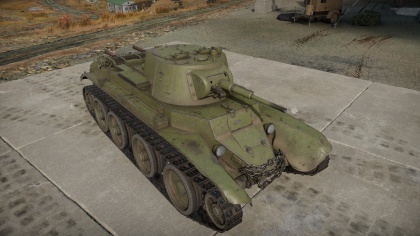 A new design team was formed in 1937 at the KhPZ factory, where they built prototypes utilizing the more armour and a heavier gun onto the design, which was called the A-32 and was approved for production as the T-34 tank. The BT tanks also serve as the basis of support vehicles such as the BT-7A artillery tan, BT-7TU command tank, OP-7 flamethrower tank, and even the TT-BT-7 remote-controlled tank. An attempt in 1940 also had the BT-7 up-armoured with hinged homogeneous armour, which added five tons to the design weight. These vehicles are not known to have seen service in combat units. This page was last edited on 3 March 2019, at 07:02.